Food Costs > How Much Does an Apricot Cost? How Much Does an Apricot Cost? The apricot is a species of the fruit that is part of the same family as the plum, and many people who eat apricots often compare them to peaches. Apricots come from the apricot tree, which is about 30 feet tall and is grown in many orchards. The origins of apricots can be traced in China. The cost of apricots depends on several factors. For example, if they are in season, they are likely to be cheaper, but on average, plan on spending anywhere from $3 to $6 per pound at your local grocery store. Dried apricots can cost $7 to $11 per pound, whereas canned apricots can cost much less, often as little as $1.50 to $3 per pound. The USDA, according to a report published in 2013, said the price of fresh apricots was $3.04 per pound, while dried apricots average $7.73 per pound. Whole Turkish apricots on Amazon.com, for example, retail for close to $6 per pound. The prices for both fresh and processed apricots have decreased over time. In 1996, for instance, apricots cost $1,253 per ton, but his amount decreased to $615 per ton in 2004 for fresh apricots and $256 per ton for processed ones. The average price then was around $346. The time of year can greatly affect the cost of an apricot, much like it does other fruits and vegetables. The apricot season in the United States is from May through AAugust. In the winter, most of the fruit will come from South America. An organic apricot, for instance, will always be more expensive than non-organic. 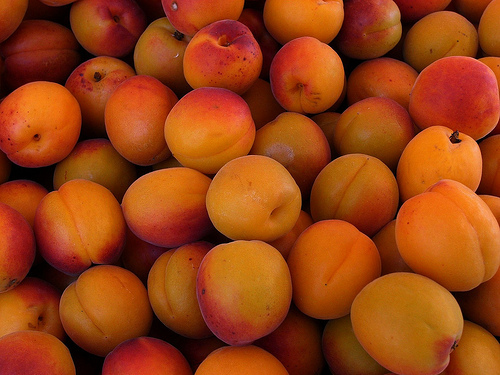 You can buy apricots from a grocery store, a special organic store or a local farmers market. The apricot can benefit the body in different ways. They are low in calories but are also high in fiber and are packed with many vitamins and minerals. Apricots also have high levels of Vitamins A and C as well as carotenes and antioxidants. Apricots are naturally sweet, tangy and can be eaten fresh or prepared as part of a dish or dessert. The apricot is generally a hard fruit that is not very juicy. Most people like to eat the fruit like you would an apple or else cut it up to put it in a recipe or dish. The apricot contains one large seed inside, which can easily be eaten around, or if the apricot is cut in half, it can simply be taken out. This fruit is commonly used for making sweet treats such as pies, tarts, jams, and even used as a side dish or an additional ingredient. Apricots help prevent cancer since they are high in antioxidants. As such, they help to fight free radicals that cause cancer. Apricots are also rich in vitamin C which helps strengthen the body’s immunity against diseases such as cancer. Apricots are rich in beta carotene which helps keep the heart in good condition. They have high fiber content which is good for cleansing the colon and maintaining body weight. Fiber helps in the metabolism process of the body. Those who desire to lose weight can incorporate apricots in their diet. They keep the eyes healthy being rich in vitamin A and carotenoids. They help prevent anemia, being a good source of iron and copper. They help relieve skin diseases such as eczema and scabies. When choosing one, always look for one with a rich orange color and avoid those that are either yellow or pale looking. The fruits, when you hold them, should slightly soft. If firm, this simply means they are have not ripened since being picked. OrganicFacts.net says an apricot can help with constipation, your bone health, heart, metabolism, ear aches, fevers, skin disorders, anemia, cancer and even asthma. Consider keeping your eyes peeled for special sales or promotions. Buy from local farmers markets. In addition to helping the production in your area, you will probably pay less. The reason for this is that there is no middle-man to mark up the price.